Some cartoons despite the limited artistic merit could serve as a perfect case study for the zeitgeist of a certain era. The Millionaire produced in 1963 is one of those rather crude propaganda pieces that involves the main subjects of the Soviet official satire of the 1960s: the American politics and society, capitalism, contemporary Western art, and pop-culture. Aesthetically, the 1960s in the Soviet Union began soon after the death of Stalin, and Khrushchev’s rise to power. In a few years, totalitarian Soviet baroque was replaced by the modern minimalistic style in the architecture and visual arts. In the Soviet animation, this style was pioneered by Fyodor Khitruk. The Millionaire by Vitold Bordzilovsky is one of the examples of the new approach of the early 60s. 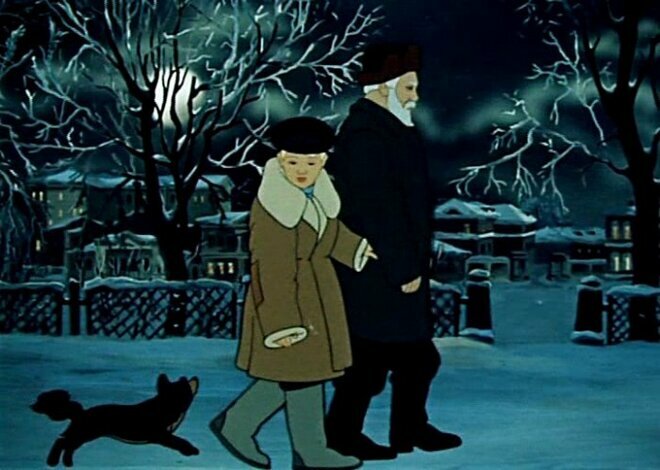 This cell animated film is executed in the sharp contrast with the Disney-like Soviet animation of 1940-1950s. While the Stalinist aesthetics was replaced with more Western-like, Soviet art continued to be highly ideological. The Millionaire is a perfect example of the Sovie political animation of the 1960s. The base of this animation short is an ideologically correct doggerel by one of the most cynical Soviet authors, Sergey Mikhalkov. When it was necessary Mikhalkov condemned enemies of the people, Nazis, American imperialists, Zionists and cosmopolitans (a euphemism for Soviet Jews), Soviet intelligentsia “kowtowing to the rotten West”, and so on depending on the demands of the Communist Party. The Millionaire was part of the satirical newsreel Fitil’ (Fuse), an important element of the Soviet visual agitation machine. 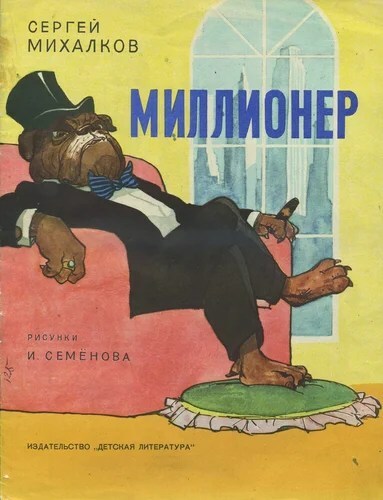 The cartoon’s plot tells a story that must have seemed hilarious to the Soviet audience: a rich lady bequeaths all her money to her beloved bulldog. The Bulldog is transformed into a rich and powerful capitalist who attends lavish parties and becomes a Member of Congress thanks to his riches. This animation should be discussed according to not only its technical and artistic qualities. In the totalitarian state, visual media played an essential role of a social engineer shaping the public opinion. The Millionaire conveys a certain social and cultural message presented by means of animation. Obviously, it’s not a purely entertaining piece. It criticizes American elite, the “cult of dollar”, and contemporary Western culture. Every small detail of the cartoon is used to enforce the message. Take for example interior backgrounds with abstract paintings and sculptures. Similarly to the Nazi Germany where modern art was labeled “degenerate”, in the USSR it was called “formalist art” and was sharply criticized by the Communist Party. Any work of art that did not fit into the rigid ideological system of the Social Realism was condemned, and independent artists were often persecuted. The cartoon shows the combination of stereotypical images, such as big cars, skyscrapers, logos, and forbidden entertainment. Logotypes that frame the night club sequence at the beginning and the end play an especially important role in both cinema and animation. Logos play the same role as geographical landmarks helping viewers understand that this cartoon is about the US. The nightclub sequence is of particular interest as it sarcastically portrays the American entertainment and popular culture. The Bulldog, as a stereotypical American nouveau riche, enjoys his status and indulges with good food, night bars, personal limo, and a luxurious household with a butler. The comical effect is achieved by the fact that such luxury, unthinkable in the Soviet Russia for anybody except the highest rank leaders, is inherited by the dog. In the 1950s, a significant part of the Soviet citizens lived in wretched conditions of communal apartments, dormitories, and temporary houses. The dancing scene was used not only to satirically depict the soulless American style of entertainment but also was aimed at the youth subculture of stilyagi, (the stylish ones) often considered a pro-Western “fifth column” within the Soviet society. Stilyagi were Soviet youngsters fascinated with American music, dance, and art. They listened to jazz and adopted Western fashion trends. In The Millionaire, jazz is treated according to this trend of the Soviet propaganda. The saxophone depicted in the first shot of the nightclub impersonates the evil of jazz for the Soviet leaders and the most wonderful music instrument for the Western-oriented youth of the 60s. Jazz is shown as an extremely vulgar type of music. Patrons of the night club continue a long line of the evil capitalists portrayed by the Soviet propaganda. The cigar smoking men are dressed in the black tuxedos with bow ties that looked extremely comical and outdated in the USSR. The frivolous women in bright, open dresses are eager to dance with anyone who is rich and famous, even if it’s a dog. The rich Bulldog is chauffeured to the “luxury bar” with a jazz band and frivolous dancers. The anthropomorphic Bulldog joins the dance circling on all four paws like an actual dog. Excited patrons of the night club follow the example and adopt his dance manner loosing human appearance and literally transforming into beastly creatures participating in some kind of black sabbath. Even skyscrapers join the dance transforming into menacing giants with bright patches of logos and ads. The streams of bright artificial light create the atmosphere of anxiety. The idea of the “moral degradation” is visually represented by the transformation of the nightclub guests into the leaping four-legged animals. In the country where people dance like dogs, why shouldn’t dogs become rulers? Visual and audio sequence together with crude verses ridiculed American capitalism. 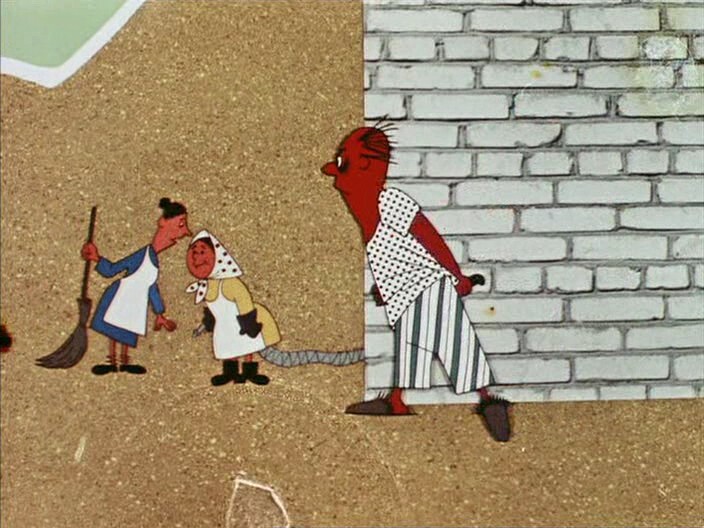 This animated propaganda was supposed to enforce anti-Western sentiments in the minds of the audience. However an excessive anti-Western propaganda led to the opposite results by the late 1960s, and more and more Soviets became interested in American popular culture. Eduard Nazarov, an acclaimed artist, book illustrator, and animation director, passed away yesterday in Moscow. Nazarov, closely associated with Fyodor Khitruk, was involved in several of his projects, including Winnie the Pooh (1969-1972). In the 1990s, he became one of the co-founders of the SHAR studio, and later supervised a highly successful Mountain of Gems animated series based on folk tales of peoples of Russia. Nazarov is best-known as the creator of such classics as Once Upon a Dog / Once There Was a Dog (1982), a tragicomic story adopted from Ukrainian folklore about an old dog expelled by his owners, and Travels of an Ant (1983), a small ant’s quest to find his home. His beloved works feature a distinct visual style and combine lyricism with a mellow sense of humor. The New Yorker published an article about an Oscar-nominated animated short “We Can’t Live Without Cosmos” by Konstantin Bronzit, a critically acclaimed animator based in Russia. 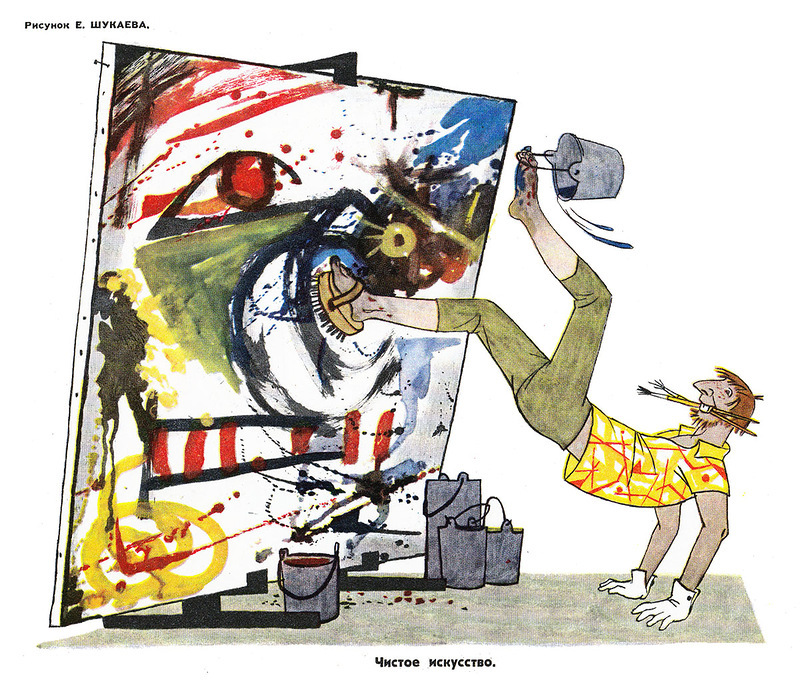 Apart from “Cat in the Hat”, several books by Dr. Seuss inspired Russian animators. The most notable adaptation is Welcome (Добро пожаловать) based on “Thidwick the Big-Hearted Moose.” A constellation of talents worked on this short piece. Yuri Koval, author and artist who was involved in the creation of such popular cartoons as Laughter and Grief by the White Sea, wrote a screenplay. Yevgeny Leonov, a beloved comedian actor and voice of Russian Winnie-the-Pooh, provided his voice. Alexander Petrov, an innovative animator and the 1999 Academy Award for Animated Short Film winner, created a unique style of this paint-on-glass animation. 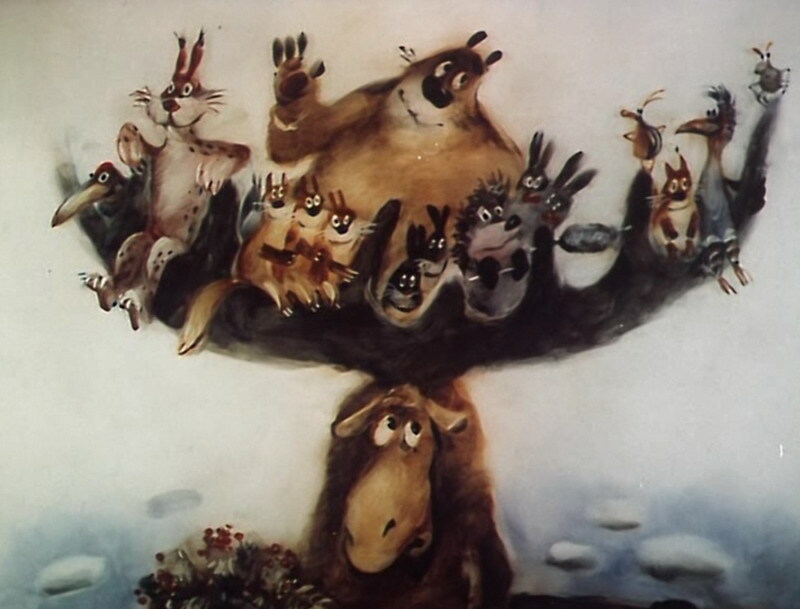 Hedgehog in the Fog (Ежик в тумане) released 40 years ago is a critically acclaimed cartoon by Yuriy Norshteyn based on short stories by Sergey Kozlov. A journey of Hedgehog through the misty forest to meet his friend Bear is among the most well-known Russian cartoons. Check out an interactive guide with comments of Norshteyn about unique solutions employed to create paper puppets, fog, and shadows in this stop-motion masterpiece. While not as widely known in Russia as some other Western children’s authors, like Alan Milne or Astrid Lindgren, Dr. Seuss inspired several cartoons. Cat in the Cap (sic) (Кот в колпаке) is loosely based on The Cat in the Hat, sans Thing 1 and Thing 2 (but still featuring a grouchy Fish). It takes place in a typical urban dwelling where children have to spend a long rainy day alone. 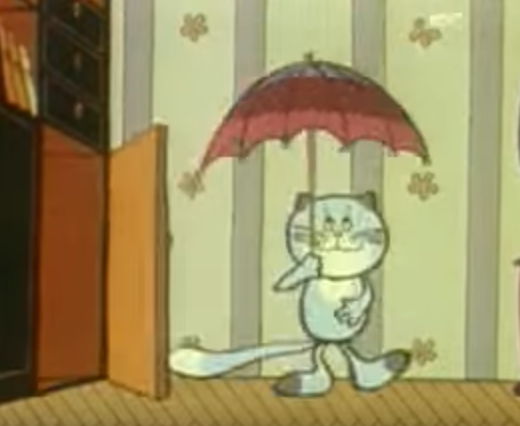 The theme of escaping into a land of fantasy from boredom of home or school is rather typical for the Soviet cartoons of the era of Stagnation, so Cat in Hat (Cap), with its protagonist, a safe entertainer who does not forget to clean the room before children’s tired mother returns from work, falls perfectly within the scope of Soviet cartoons of that time. Another great animated film by Leonid Shmelkov, My Own Personal Moose (Special Prize at the Berlin Film Festival) – a story about a timid boy named Misha, his childhood dream, and his relationship with his gloomy, short-spoken, but caring father. It’s a film about love, growing up, and a moose Misha hopes to find one day.